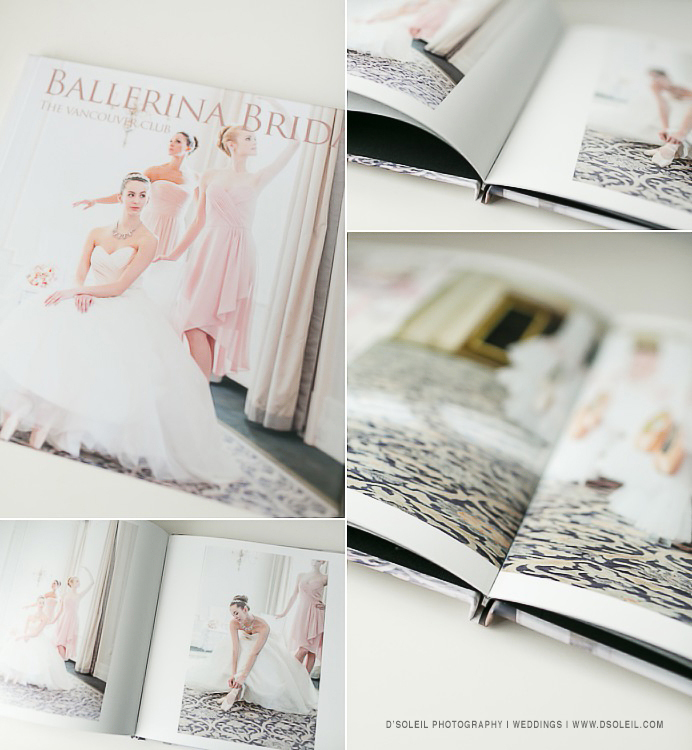 This is a photo book I recently made for my friend CC Roa featuring a Ballerina Editorial I shot at the Vancouver Club. It’s a lay flat photo book for weddings and engagement sessions, often used at the welcome/sign-in table at weddings. I’ve made several of these in the past, and they’re always a big hit with guests. The difference between professional photo books and those you get at Costco or the supermarket is the quality of the paper, printing, binding, and feel. These were printed on photographic pages with a matte touch and are thicker than typical photo books. They also lay flat, making them more enjoyable to view and easier to write on. They’re more lightweight than a professional wedding album and pages are thinner, but still durable. The one shown here has a photo cover, but they come in linen and leather cover options as well. If you are considering a wedding photo book, contact me for details. I can help create a photo book for your wedding in the size and style you need. Starting prices are reasonable and delivery times range from one to three weeks.